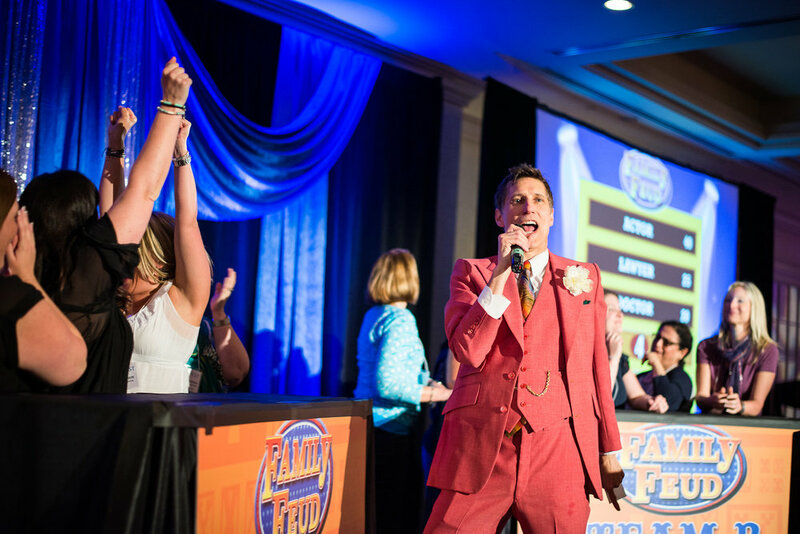 Join Richard Dawson Jr. as he hosts your very own customized version of the hit game show Family Feud! This version gets the whole gang involved with 3 rounds of questions with 10-15 team members per round. A lightning round face-off determines the winner and everyone is treated to a fun game of Name that Tune. We bring an amazing host, assistant, and everything needed to create the best experience for your guests. Top 5 answers are on the board…let’s play! Perfect for interactive after-dinner entertainment! We will coordinate with your venue and AV staff to assist in staging and running the technical components of the show. 3 "Top 5 answers on the board" questions per round are asked. This allows for 6 teams of 10-15 guests each. Our tech keeps score throughout the game and announces the top 2 teams, who then face off in a fast-pased trivia battle. After the winning team is awarded, the energy in the room will be high, so we end the game on a literal high note by playing Name that Tune with everyone.